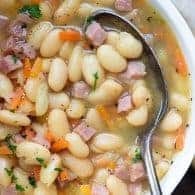 My white bean and ham soup recipe is made with Great Northern beans, plenty of diced ham, and lots of veggies to make for a hearty soup! Big thanks to Hurst Beans for sponsoring this post. I’m allllll about Easter dinner, you guys. So much good stuff happening. 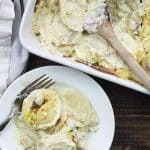 Not only is there a giant ham to be devoured, you’ve also got a table full of sides like my cheesy scalloped potatoes or crockpot hashbrown casserole. 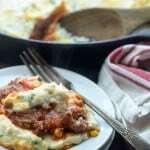 My Jiffy corn casserole is always on the Easter table. For dessert, we never skip my blackberry cobbler. Of course, we also enjoy the Easter egg hunt with the kids. Anyway, Easter is fabulous and we love it. We especially love the leftovers. By day 3, ham is starting to get boring on it’s own and that is when this ham and bean soup recipe comes into play. 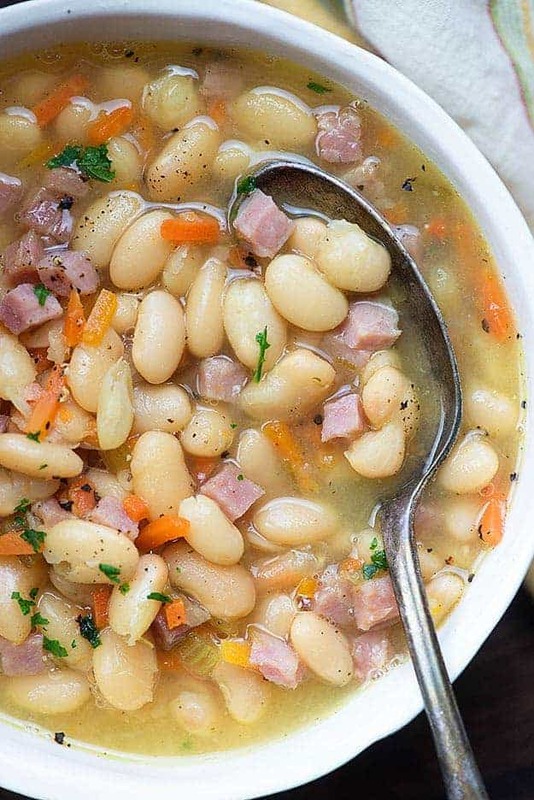 You guys this is the best ham and bean soup and it’s so simple and economical! 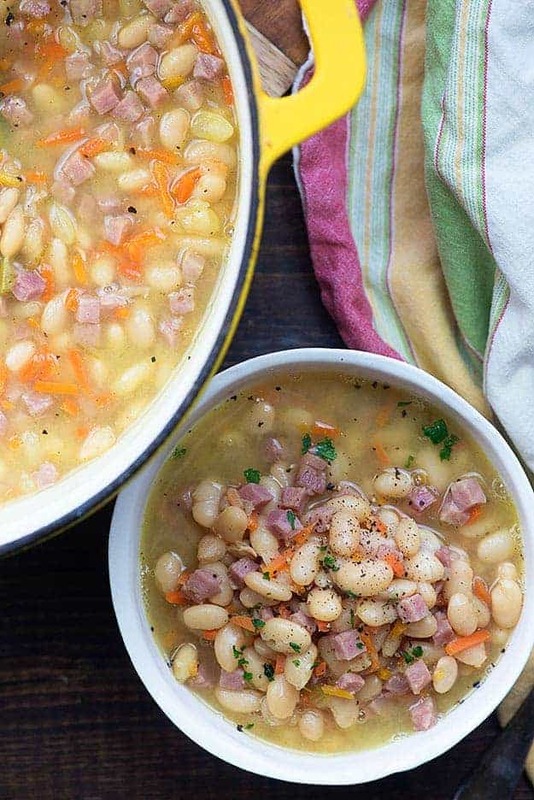 I’m working with Hurst Beans to bring you new ways to use their dried beans and today we’re featuring their Great Northern Beans in my white bean and ham soup! 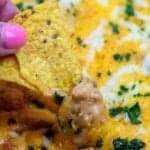 Cooking dried beans might seem a little intimidating the first time you try it, but it’s really quite easy. First, you’ll empty your package of beans into a colander and sort through them for any rocks or debris. Rinse them well. A lot of people prefer to soak their beans overnight, but it’s completely not necessary. 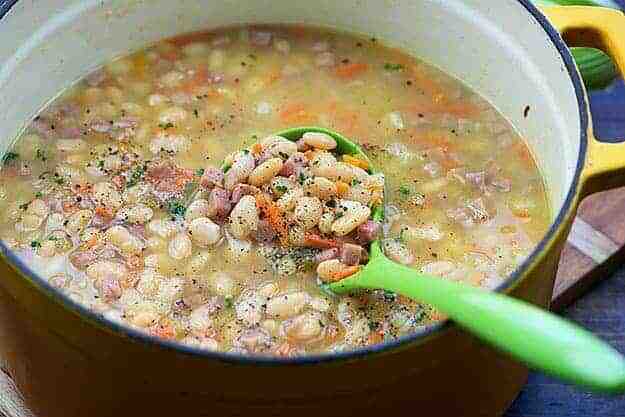 This white bean soup features no-soak beans that come out nice and tender, so give my method a try! You’ll saute the vegetables that season the soup in a little olive oil and then add in your beans and chicken stock. Bring that to a boil, reduce to a simmer, and cover with a lid. You’ll want to cook until your beans are mostly tender, about 2 hours. Then you’ll add in your seasonings and ham. 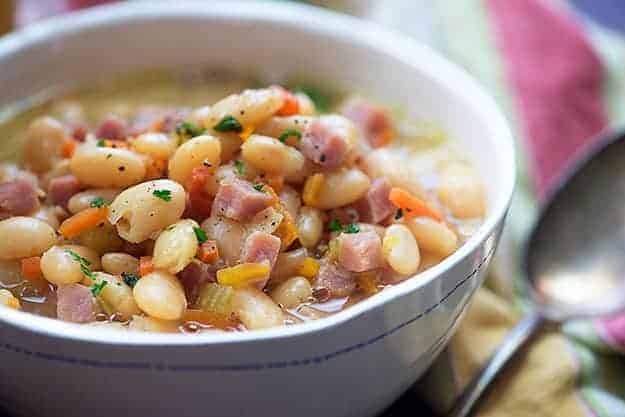 Continue cooking for another 30 minutes to an hour, to get tender, creamy beans and the best ham and bean soup! 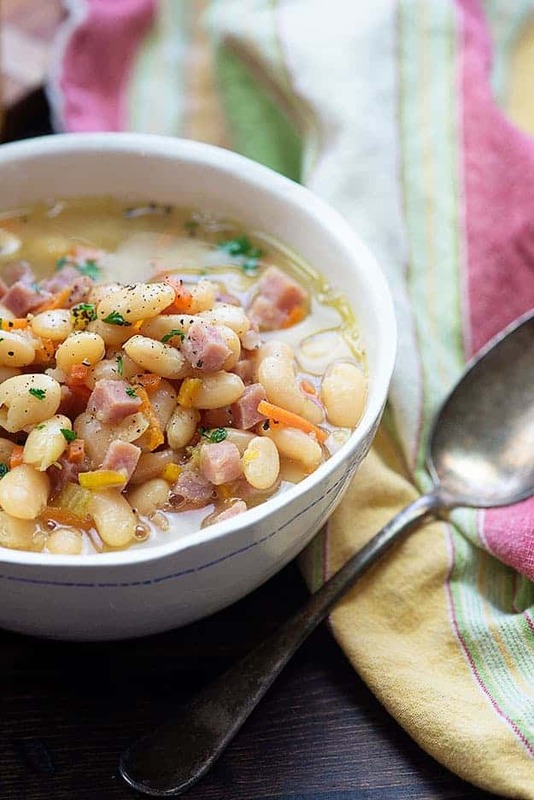 This Northern bean and ham soup is a staple in my house. If we don’t have leftover ham in the fridge, we’ll just grab some already diced ham at the grocery story. 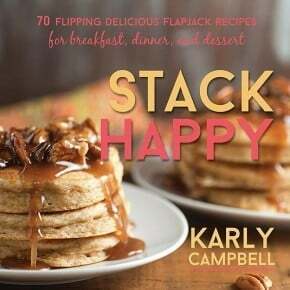 Such an easy meal! Does your family have a favorite white bean soup? 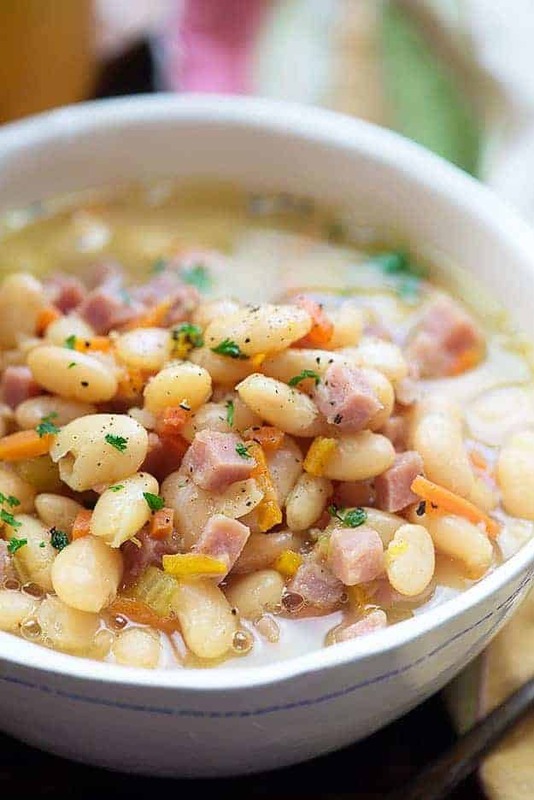 Hope you enjoy this bean and ham soup! Let me know if you give it a try. 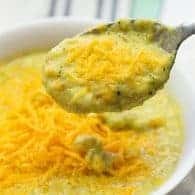 This is the best ham and bean soup! 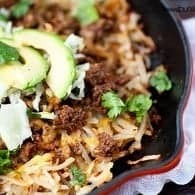 It's made in just a few hours on the stove top with minimal work and is always a hearty and satisfying dinner. 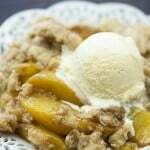 Serve with homemade cornbread. Rinse and sort through the beans, discarding any rocks or debris. Set aside. Reserve seasoning packet for later. Dice the onion and celery. Peel and shred or finely dice the carrots. Mince the garlic. Add the oil to a large stock pot over medium heat. When hot, stir in the onion, celery, and carrot. 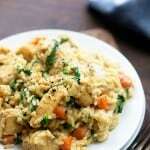 Cook vegetables until softened, about 5 minutes. Stir in the garlic and cook 30 more seconds. Add the chicken broth to the pot along with the dried beans. Bring to a boil over medium heat, reduce to a simmer, and cover with a lid. Cook for 2 hours or until beans are mostly tender. Add the ham, salt, pepper, and reserved seasoning packet to the soup. Continue simmering for 30 minutes to an hour more, or until beans are tender. Add additional broth as desired. I don’t have this brand of beans. What’s in the seasoning packet? Thank you! I don’t know exactly what is in the seasoning packet. 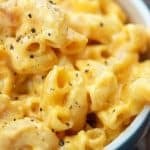 I would add in some garlic powder, onion powder, smoked paprika, and additional salt. I couldn’t find that brand of beans in our local store. Can you give me alternates for the seasoning packet? Or tell me what is in it? I usually make ham and beans soup with the 15 bean and barley soup package. 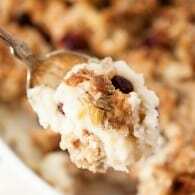 But, I want to try your white bean recipe. Next trip to the store I’ll grab some and give it a try. 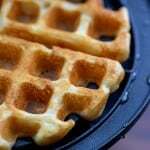 I usually either serve with buttermilk cornbread or hush puppies. 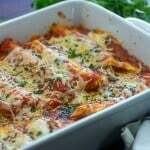 I love to cook big batches (just my husband and I left) and give good size servings to family, friends, and sometime just acquaintances. Last weekend a furniture delivery guy smelled my soup cooking and just kept saying how wonderful everything smelled so of course, I invited him to stay for lunch. He was at place in his schedule he could take a break so we had the joy of his company. My mom always taught us to be prepared for the unexpected and we have been blessed by many. 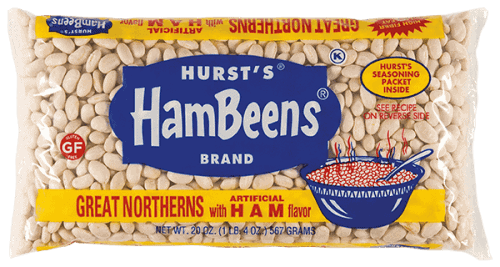 Is this the hurst great northern beans with ham packet seasoning?